The Kern River is Wild and Scenic river, designated by Congress in 1987, to help protect and maintain its beauty, wonder, and integrity. It is a popular place for camping, hiking, fishing and recreational vacation. The main branch of the river (sometimes called the North Fork Kern River) rises from several small lakes west of Mount Whitney in the high Sierra Nevada mountains in northeastern Tulare County, in the northeast corner of Sequoia National Park. It flows south through the mountains, passing through Inyo and Sequoia national forest, and the Golden Trout Wilderness. The Little Kern River joins from the northwest at a site called Forks of the Kern. At Kernville the river emerges from its narrow canyon into a widening valley where it is stored in Lake Isabella, a reservoir formed by Isabella Dam. The area was once known as Whiskey Flat, the former location of the town of Kernville. The South Fork Kern River joins in Lake Isabella. Like the North Fork, the South Fork rises in Tulare County and flows mainly south, through Inyo National Forest. After entering Kern County the South Fork curves to the west and flows into Lake Isabella. Below Isabella Dam the Kern River flows southwest through a spectacular rugged canyon along the south edge of the Greenhorn Mountains, emerging from mountains east of Bakersfield, the largest city on the river. In the Kern's lower course downstream from Bakersfield the river is highly diverted through a series of canals to irrigate the farms of the southern San Joaquin Valley and provide municipal water supplies to the City of Bakersfield and surrounding areas. In this region near Bakersfield the Kern River once spread out into vast wetlands and seasonal lakes. Due to water diversion and Isabella Dam the Kern River's discharge changes considerably over its length. The highest daily discharges occur above the dam on the North Fork section of the Kern River. The Isabella Dam serves to regulate the flow of water in the river channel for two main reasons, flood control for Bakersfeild and supplying water to farmers. 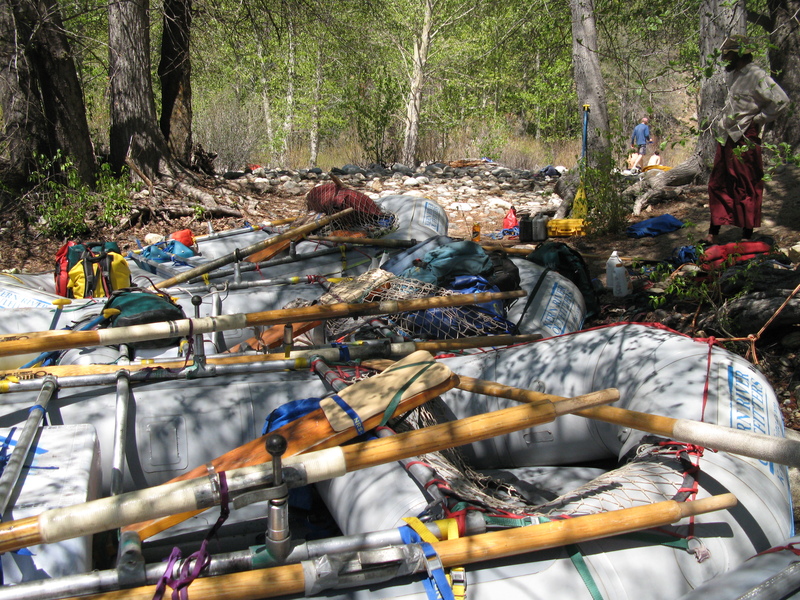 The Forks of The Kern: Three day, class V, adrenaline packed rafting trip. Literally twenty miles of nonstop action where you are resting in the class IV rapids. This is the best technical, class V, whitewater rafting in California and the U.S.
Thunder Run: One day, class V, white-knuckled I can't believe you expect us to run that rapid, wild hair raising fun. Words cannot describe the intesity of this class five rafting trip, and it's only a one day trip. Great for people from nearby Southern California.